What happens on your first driving lesson? The rest of the lesson was spent working on driving the car. If I made a mistake (eg stalling!) the Instructor explained what I had done wrong and how to correct it. And the series of lessons always focused on driving the car, each new lesson brought fresh challenges (eg three point turns and reversing round corners) – but always in the context of driving. What happens on your first flying lesson? (ii) Then they went to the plane, sat in it and fastened seat belts. (iii) Then – under the Instructor’s supervision of course – he piloted the plane into the air! The rest of his lessons followed a similar structure, the theory of flying followed by the practical application of that theory – flying! What happens on your first bass lesson? (vi) Then the Instructor proceeds to talk about scales. And the next series of lessons follows on that theme…more scales, followed by their partners in crime, arpeggios. Followed by extending scales over two octaves, and then two octave arpeggios…and on and on and on. In my cases it was to emulate Geddy Lee (from Canadian power trio Rush) and to play in a band with my friends who were also learning (David Coombs on guitar and Kenny Brewster on the drums – even though he didn’t have a drum kit. Go figure that one). So I got a bass and an amp, got a teacher and started having lessons. And I was away, right? Learning all the tunes I wanted to play – Rush, Maiden, the kind of stuff a 16 year old kid listens to? Right? And so did the second. And the fourth – though to his credit he taught me to read music too(this being back in the day before the widespread availability of Tab). What about learning some tunes I always asked? No explanation of why this was so important that I had to learn a ton of scales and arpeggios before I could start playing songs. No explanation of how learning these scales and arpeggios would then facilitate learning the songs I wanted to play. To cut a long story short I went through various teachers – all of whom wanted to teach scales –eventually I went my own merry way and started learning songs! The Police, Queen, Rush, some Iron Maiden and then onto soul and motown (you gotta love that James Jamerson). Fast forward to the early 90s and I’m now in a band, starting to earn some reasonable cash and I decided that I wanted to really try and improve my playing so I did some research and I found out who was the most regarded teacher in the UK, an American guy who’d been to Berklee, taught some famous players too (Pino Palladino for one). And guess what he taught? Only this dude was the Arch Guru of scale teachers – he taught the modes of the major scale (all over multiple octaves, with extension fingerings and all of the associated arpeggios both in triad and 4 note form) but also all the modes of the Melodic Minor and Harmonic Minor scales too. I persevered as long as I could, figuring we’d get to some good stuff eventually but we just never did and I lost enthusiasm and gave up taking lessons from him and went back to playing songs. But isn’t learning scales the traditional approach to learning music? The application of that concept in a song of some sort. Seriously, go check it out if you don’t believe me. So why isn’t there a bass method with this approach? Why don’t teachers take this approach? There are a couple of books out there that sort of take this approach – however they do it with songs written expressly for the purpose of the book (ie songs we’ve never heard of), which logically you would assume would be a copyright thing. However that becomes harder to work out when you realise that one of these methods is published by Hal Leonard who own the publishing rights to soooooo many songs that you and I know and love and would like to learn to play. And maybe that’s what they were taught when they were learning, and they just don’t know any better. Learning songs sounds cool –much cooler than scales! – but can it make me any better? Why should bass be any different? The critical element is to make sure that the song sequence that the student learns starts off bassic [sorry, couldn’t resist 🙂 ] and progresses gradually to harder tunes that will stretch their techniques and capabilities. With the piano you don’t learn Beethoven’s 29th Piano Sonata in your first lesson (or even your first year!). With the saxophone you don’t learn Donna Lee (Charlie Parker) in your first week. And the same goes for bass. 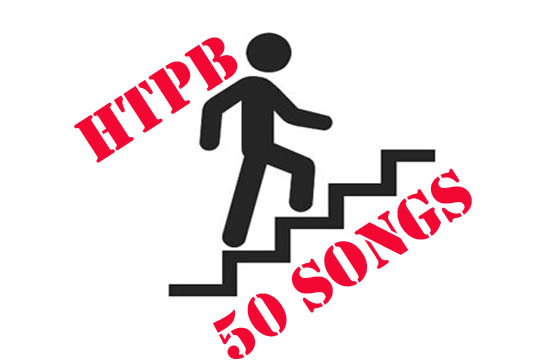 I’ve prepared a list of 50 songs aimed at taking beginning bass guitarists through to a pretty high intermediate standard. And it forms the spine of my lessons with face to face students and also my recently started online bass lessons. And that enjoyment factor promotes memory retention. In fact there’s a book you should check out – it’s called THIS IS YOUR BRAIN ON MUSIC by Daniel Levitin, you’ll find it at Amazon – but scientific research indicates that memory of something we are practicing on is strengthened if it is something that we care about. Which do you think you’d find more enjoyable: playing through something by Rush (or Muse, or The Killers, or My Chemical Romance or your favourite band) or playing 2 octave melodic minor scales around the cycle of 5ths? Yeah, I thought so. Don’t we need to know about scales and arpeggios though? But scales and arpeggios are simply parts of the musical alphabet. If you want to progress from being an intermediate player to being a high class player then you’ll definitely have to learn more about them (though I still think the teaching of playing them rote is just wrong). But for beginners you only need to know a bit of scale theory which won’t take much time to learn. And that leaves you with more time to do what you like best…. After all, isn’t that what we all signed up for in the first place?